Thanks to Roland, so much fun stuff goes on at my house while I'm at work, I get kind of jealous and kind of worried at the same time. 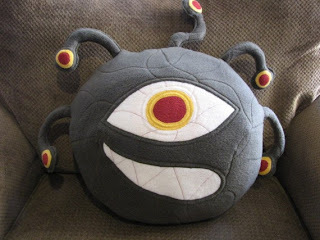 I was thinking of installing a Monster-Cam, but then I came across the very impressive Eyeball Monster from Freaky Fleece! 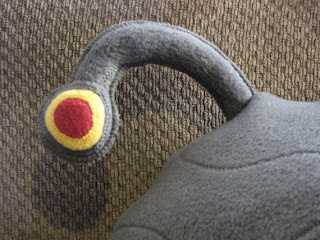 Freaky Fleece Has tons of Creatures and other Home Protection Products, but once I read about Eyeball Monster I was sold! Eyeball Monster's six eyes guarantee my house will be well "looked after" and that nothing that occurs will be missed on his watch! Finally I will be able to concentrate at work! Just imagine what I will be able to accomplish! I'll be a whole new woman! The money will come rolling in!